Tomorrow is one of the best days of the basketball year. A slick bald man will announce which young players have to move to cities they’ve never been to before. CAN YOU FEEL THE EXCITEMENT? Trade rumors are flying, promises are being doled out, and minor injury and character concerns are being blown up into full-on red flags. In order to understand the draft, let’s rank the prospects that will be picked in the first and early second rounds, including a tier system to better understand the space between prospects. Within each tier, team needs and style can dictate which player each franchise would prefer, but the differences from tier to tier are more drastic. This draft has been called weak, but that’s only really at the top. There’s value to be found throughout the draft, for the teams who can find it. Expected All-Stars with the chance to be great. This comes as no surprise. Really, the most surprising thing about having Simmons atop my board is that I have him in a tier by himself. Brandon Ingram is the only player in this draft class who is even comparable to Simmons, and for a variety of reasons, I still would not understand any team picking first preferring Ingram, especially the Sixers. The same can’t be said of Ingram. Simmons is also strong. And fast. If the stopwatch at the LSU Combine last October is to be believed, Simmons ran the 80 foot sprint faster than anyone DraftExpress has ever recorded. Faster than John Wall, Derrick Rose, or Russell Westbrook. He’s more than a body to be admired. He handles the ball like a guard. Simmons is an elite passer, full stop. When you add “for his size”, you can change “elite” to “generational”. He rebounds at impressive rates, leading the SEC in boards per game as a freshman. He was 2nd in the SEC in steals and 5th in assists. To me, there are two things to fear about Simmons, and they go hand in hand. There are questions about his attitude and his demeanor. He was very passive at times at LSU, which is particularly odd, because his team at LSU did not include a player worth being passive towards. When Andrew Wiggins and Ben McLemore were passive at Kansas, people shrugged it off as a freshman deferring to upperclassmen. Simmons’ team didn’t have any upperclassmen of note, so people looked for him to lead and carry the team at times. On top of his on-court passiveness, his teammates on the Australian national team have not spoken highly of Simmons and he won’t be playing in the Olympics this summer. Simmons final game at LSU was a 33 point loss in the SEC Tournament, before the Bayou Bengals turned down a spot in the NIT. Simmons’ second issue is his jump shot. Per Hoop-Math.com, Simmons attempted 176 jumpers last season. He made only 58 of them, good for only 32.9%. It got to the point that people questioned if Simmons shoots with the wrong hand, led by SBNation’s Ricky O’Donnell. These problems are intertwined, in part, because the jump shot issue is certainly correctable. Simmons 67% free throw shooting suggests there isn’t something seriously broken with his shot. He may well be able to develop a 15-18 foot range, and eventually 3-pointers too. But for a player with attitude questions, that would be less likely. Simmons can be truly great, if his game continues to grow and develop. That won’t happen unless he is committed to making it happen. Now, even with that question in the air, I’d still pick Simmons with the top pick. Teams get so few chances to make selections at the top of the draft, especially all the way at number one. When you have those chances, you need to capitalize and use the opportunity to attempt to acquire a game changing player. Simmons’ ceiling is worth the risk that he’ll never reach it. For the Sixers, this is even more the case. Brett Brown spent decades in Australia, having coached many of the country’s biggest names, including Ben Simmons’ father. If any NBA coach or executive can get to the bottom of Simmons’ character questions, it is Brett Brown. 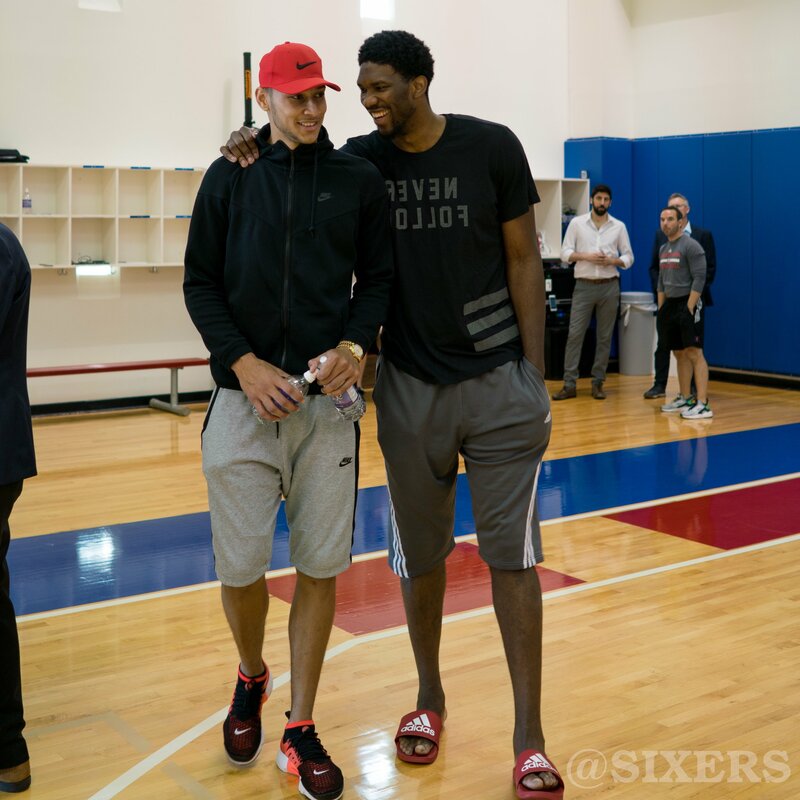 If any coach is able to tap into, motivate, and develop Simmons, it is Brett Brown. 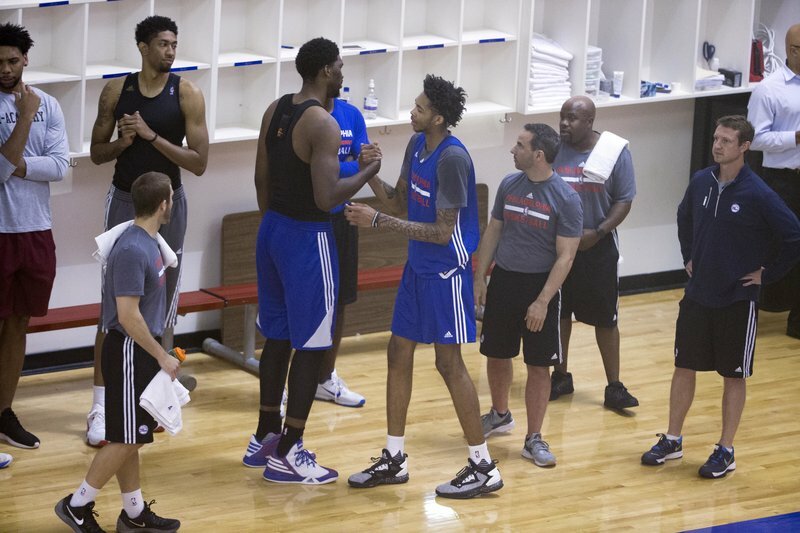 If indicating reports are correct, Brett Brown is about to start earning his paychecks in a big way. Potential All-Stars, though likely not franchise cornerstones. Ingram doesn’t have the ceiling that Simmons does, yet he has a bright future. 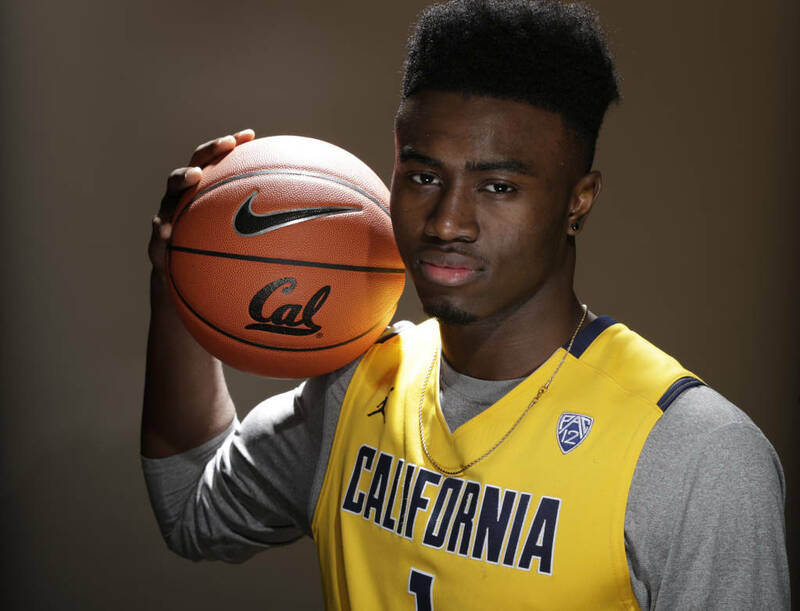 If you’re looking at a thin, hot shooting, lanky forward and thinking “the next Kevin Durant”, toss out that idea. Ingram doesn’t have the first step Durant has (or had at Texas) and isn’t a real sharpshooter like KD. Ingram makes shots, but Durant doesn’t miss. I think Ingram compares more to someone like Rashard Lewis, or if we’re being pessimistic, Trevor Ariza or Chandler Parsons. He’ll never be the focal point of a team, but he’ll be able to help a team win games, playoff series, and championships in the right role. Have the potential to be one of the 15 best at their position. Many, many people, lots of whom are very smart basketball minds, are expecting and assuming that Kris Dunn will be the first point guard selected in Thursday’s draft. As loyal college basketball watchers, we can all remember why. Dunn dominated defensively and was an effective floor general on the offensive end. Wade Baldwin, meanwhile, was….a guy you didn’t hear much about until this month. Now he’s climbing draft boards and, if you dig deeper, it’s clear to see why. Dunn, on a per game basis, was better in many metrics. He’s also two years older and played alongside the Big East’s leading scorer, Ben Bentil. When we look at metrics that boil things down to a per possession basis or account for Dunn’s high usage rates, Baldwin comes out on top. Baldwin can flat out get into the paint and draw contact. He did so at incredibly high rates this season. Not to mention, when he wasn’t getting fouled, he finished everything at the rim. 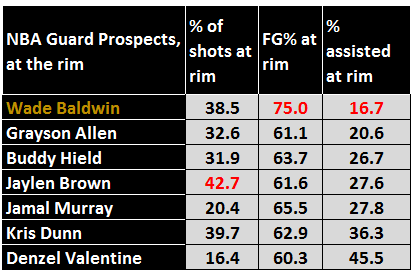 Pulling from an earlier PB piece about Buddy Hield, Baldwin finished his drives better than every other guard in this draft class. He took the 3rd highest percent of his shots at the rim, finished the highest amount, AND received the fewest assists. He’s not just a running back on the basketball court either. He also shot better than 40% from long range this season (on more than 3 attempts per game). Last season, he was even better, at 44% from outside. To top it off, he’s an 80% career free throw shooter. Defensively, he doesn’t have the counting or even efficiency stats that Dunn had this season. Kris Dunn’s quick hands are one of the most impressive skills in this draft (though whether or not they translate to the next level is another question). But Baldwin is a plus defender in a great body. He’s 6’4 with a wingspan over 7 feet. He’s thick-chested and strong for his size. He’s not John Wall or Russell Westbrook athletically, but no one is. Baldwin has shown the ability to score in a variety of ways and defend opposing guards. In a draft with holes near the top, that’s value worth taking. We covered Luwawu in our international prospect preview the other day, but what the hell, let’s watch him dunk again. There’s tons to love about Dunn. He’s long, quick, and aggressive. He finds teammates and nabs a ton of steals. His shooting is better than he’s given credit for, having made 37% of his threes last year. My biggest worry comes from his age. Dunn dominated a lot of games last year. At 22 years old, he should be dominating games against teenagers. Night after night night in the NBA he’ll need to battle with the Walls, Westbrooks, and Currys of the world. I think he’s capable of answering that bell, but not to the effect he did at Providence. He’ll be a bit erratic at both ends, though the treats will be worth the tricks. Murray is capable of surprising people next season. After coming to Kentucky as a point guard, he accepted a role off the ball, allowing Tyler Ulis to run the offense. He thrived there, making a ton of shots running off of screens. Scouts have since questioned his quickness and explosiveness, worrying that he isn’t able to handle the ball at the next level. Much in the same way John Calipari limited Karl-Anthony Towns to scoring on the block, I think Murray’s time at UK doesn’t accurately portray who he is as a player. The big man he’s making look silly with the hesitation dribble there is former top 10 pick Anthony Randolph. Murray led Canada to a win over the US team in the semifinals, before collecting a silver medal. He averaged 16.0 points, 3.2 rebounds and 2.4 assists per game, while shooting 45.9% from the field at the tournament. There are worries about his lateral quickness and overall athleticism. He’ll never be a great defender, but if he puts in effort, he can be passable. On the offensive end, a quick release on a deadly outside shot will keep defenders on their toes, allowing him more opportunity to turn the corner and get to the rim. With the right pieces around him, Murray could be a nice piece for many teams. Minnesota would love him at #5. Bender is another international prospect covered in our preview Monday. He’s got a chance to do some really nice things, if the right team develops him correctly. If you want to get excited about a dunky French guy, you have two options this year. Or just love them both. And read about them here. McCaw is being heralded as one of the only true two-way players available in this year’s class. He certainly showed that this year in Vegas, filling box scores for the Runnin’ Rebs. He finished in the top 10 in the Mountain West Conference in Assist Rate, Steal Rate, Free Throw Percentage, Points, Assists, and Steals. He led the conference in steals, thanks to high-level defensive pressure. Watch this closeout that leads to a block. It’s absolutely textbook. Lots of people see McCaw as a future starter, but I’m a tad unsure of his offensive abilities. He makes open shots, yet doesn’t create as much as a combo guard should. I think he projects as a top of the line 6th man and elite defender. I’m pretty high on Jackson, and have been for a while. He’s a natural born point guard, with a fighter’s mentality. He won’t score a ton night in and night out, nor lead the league in assists, but he’s quick, strong, and smart. He makes the right decision on offense, then hikes up his shorts and plays great defense on the other end. Even if doesn’t quite have the athleticism to be a star, he’ll always contribute. The Utah-Indiana-Atlanta trade makes his landing spot a bit murkier, but he deserves to be called in the late lottery. I’ve spent the last three months muttering under my breath, “It’s just one game…It’s just one game…”. 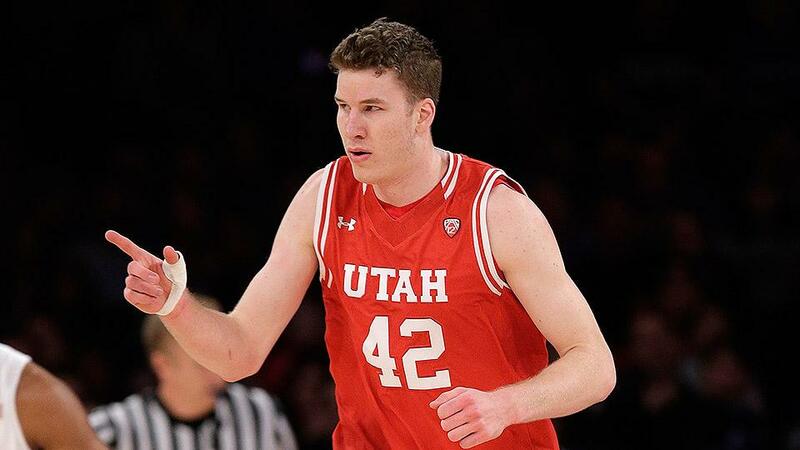 If you’re a fan of Jakob Poeltl’s game, that’s become your mantra, ever since he and Utah were routed by Gonzaga in the NCAA Tournament. Fellow potential lottery pick Domantas Sabonis wiped the floor with Poeltl. Sabonis finished with 19 points and 10 rebounds. Poeltl managed only 5 points and 4 boards. Watching that game, you’d be hard-pressed to take Poeltl over Sabonis, or over most of the bigs on this board. But….it’s just one game. I’ve loved Poeltl for a while, having highlighted him as a prospect to watch each of the last two seasons. He’s big, with active, light feet. He knows how to navigate a pick and roll, on both ends of the floor. Poeltl projects as a similar player as Jonas Valanciunas, but looks to have better hands and a softer touch around the rim. Deep breath. It was just one game. When I say Blake Griffin meets Kevin Love, you’d think he’d be atop this list. Sure, but that would be under the assumption he was grabbing the best of each guy. Not quite. Ellenson has an NBA body at 6’10, and has the ball skills and offensive prowess of Griffin, but is not an athletic marvel like Blake. He has a soft touch like Love, but also defends like him (which is to say, he doesn’t defend at all). Though he’ll get tortured in the pick and roll defensively, a big who can stretch the floor or grab a rebound and go coast to coast still has a spot in the league. He’d make a great Toronto Raptor and will be available at #9. There are 10,000 things to love about Tyler Ulis, and only one to dislike. He is lightning quick, defends his brains out, leads an offense like an ancient warrior king led his army, makes outside shots, and finds his teammates for easy baskets. He was the best point guard in college basketball last year. Ulis posted 17 points and 7 assists in a major conference. Tyler Ulis is listed at 5’9 and 149 lbs. Though that may be adorable, that’s really small for an NBA guard. He measured 5’10 in shoes with a 6’2 wingspan and 38″ inch vertical. If he can use his long arms and athleticism to make up for his lack of height, he has a chance. To me, it’s not about his height as much as his weight. When you think about the kinds of sub-6 foot guards who last in the NBA, they don’t weigh less than a Labrador Retriever. Nate Robinson and Isaiah Thomas are both thick shouldered and strong. Robinson is trying out for NFL teams after retiring from basketball. Unless Tyler Ulis’ skills are great enough to re-write history, he has a very defined ceiling. At the end of the day, he can be a very effective back-up guard, capable of making a 2nd unit off the bench dominate their opposition. Quick reminder that I root for Gonzaga, which makes my opinion on Sabonis both biased and nuanced. I love this kid. He always stepped up to the plate, no matter the challenge. He’s a fundamentally perfect big man. If he were 7’2 or had any athletic freakishness to him, I’d have him third on this board. Problem is, he is lacking those extra bonuses. You aren’t going to build around Domas Sabonis, but you will be glad you have him. He’ll cover 4s and 5s at the next level, make great inside-to-outside passes, and battle under the glass every single night. In a playoff series, when things slow down and the whistles get put away, you want Sabonis on your team and on the floor. Really nice player, a bit under the radar. He came to Florida State as a high profile recruit and showcased that ability for a bad team. He makes shots, defends with energy, and plays a perfect game for a role player in 2016. Toss Robert Covington, Iman Shumpert, Danny Green, and Kent Bazemore in a blender and the resulting sloppy gazpacho will look something like Malik Beaseley. From one projected role player to another, but with some different skills. Bembry is longer and a bit less explosive than Beasley, yet he has better court vision and makes better decisions. 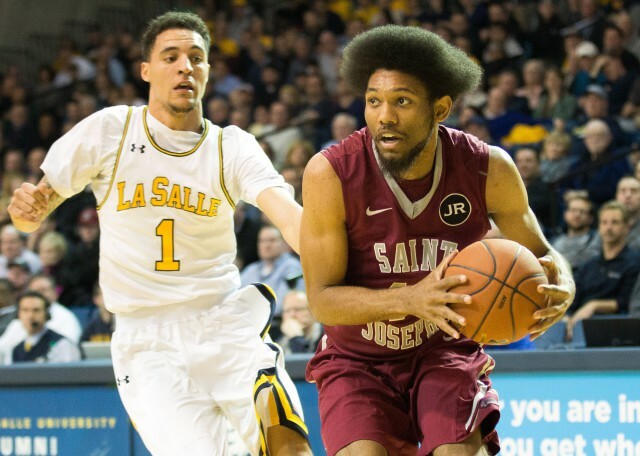 I went to see St. Joe’s play Villanova this year and spent the rest of the season proudly defending Bembry as the best player in Philly. Even after Villanova cut the nets down, I’d take Bembry over any Wildcat. That’s how good he was as the centerpiece for the Hawks. He averaged 17 points, 8 rebounds, 5 assists, one steal and one block. He’ll do everything for a team and proved himself unselfish enough to accept whatever role St. Joe’s needed him to fill. After leading the Atlantic-10 in scoring as a sophomore, he dialed his game back and didn’t even lead the Hawks in scoring as a junior. He did, however, increase his rebound and assists, while cutting turnovers. This ranking was made before news of Valentine’s questionable knees started to surface. I’m not a doctor and I don’t have the accurate diagnosis, so let’s just hope for the best. That being said, Valentine was a great passer, scorer, and rebounder for Sparty this season. I question how many of those skills will translate to the NBA. He’s only 6’5 and not quick enough to cover many guards. His free throw and 3-point percentages jumped from 28/66 as a freshman to 38/68 as a sophomore to 42/83 and 44/85 as a junior and senior. Sample size should be big enough to show that he actually improved, but there are concerns about players who make that large of a jump. Justin Anderson jumped from around 30% his first two years at UVA to a 45% shooter his third year, before shooting 27% from downtown in the NBA this year. Without a quick enough first step to make people respect him as a driver, Valentine will need to make shots with a hand in his face. His passing will always be there and he has an impressive basketball IQ. I expect him to become the type of player Sean Livingston has become for Golden State. That role is dictated by the right circumstances and foundation for Valentine to thrive in. The wrong fit could limit his skills at the next level. A few months ago, I took a deep dive into Hield’s chances in the NBA. I came away with a moderately positive outcome, expecting him to have a productive career. When I began these rankings, I shocked myself with how low Buddy was dropping. This was, in part, due to the other members of his draft class. The 2016 NBA Draft may not produce many stars, but there is value beyond the top two. More recently, I pulled Buddy’s numbers and compared to other prolific shooters who had question marks elsewhere on their resume. If you’re wondering where Steph Curry and Klay Thompson are on that list, your mindset about Hield is a bit off. Curry is an elite ball-handler and Thompson plays top-level defense. Hield, and the other shooters listed above, struggled with many other aspects of their games. Buddy shot better this year than Morrison ever could. If Hield does nothing more than translate that skill to the NBA, he’ll have a roster spot and get minutes. Jodie Meeks never added any other elements to his game and would be a pretty apt comparison for Buddy, if he does likewise, failing to build on his game. Redick should be Hield’s role model, having carved out a niche greater than that of just a shooter. JJ Redick’s not a great ball-handler, passer, or finisher, but he does all of them well enough and is an above average defender. Most don’t see Buddy Hield reaching even that distinction. If he can, he may be worth taking in the late lottery. The most likely scenario leads Hield to the area between Meeks and Redick. A nice career and a rotation player, nothing more. Perfect for the mid-first round. He’s young, athletic, and skilled. There are certainly reasons he’s become the hot name this month. He was called for 6.5 fouls per 40 minutes. 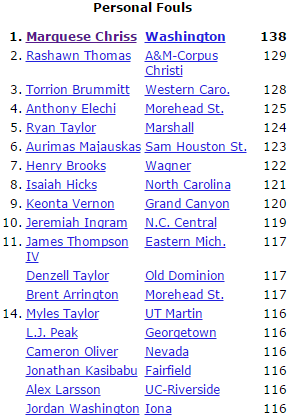 Compare that to Henry Ellenson, a far less athletic player, but who plays a similar position, who posted less than half that number (with 3.0 fouls per 40). This likely means Chriss is out of position too often, over aggressive, and even less coordinated than you’d like to see. He’s a raw piece of athletic clay at the moment, drawing comparisons to Marvin Williams. That’s not exactly high praise. In God’s person building factory, they made the perfect body for a small forward, then they forgot to add real basketball skills. He can’t shoot, pass, or handle the ball well. He has the tools to be a great defender and needs to learn how to use them. If he can use his athleticism to get to the rim on offense, his value as a defender able to cover three positions makes him an intriguing prospect. The sky is the limit, but he’s got a ways to go to reach it. The Zubac-Zizic debate is tearing this country apart! If you want to form some sort of opinion on the two before we hear their names called, my reasons for liking Zubac just a little more were posted here Monday. He’ll turn 24 this season, but his skills and intangibles are set in stone. He can shoot, he handles the ball well for his size, and dear God, he can defend. I have nearly no doubt that if any team from either Conference Finals series takes him late in the first round, he’ll be an integral part of their rotation by playoff time. Take your pick. Some longshots and some safer value, depending on what you need. He’s going to defend. The question remains how he contributes on the other end. If he can be Tony Allen or even Marcus Smart, no one will really care what he does offensively. Potentially a tournament darling, sneaking his way into the lottery. We just haven’t seen enough evidence that Malachi Richardson can play consistently impressive basketball. SBNation’s Ricky O’Donnell had a nice breakdown of Richardson’s resume. Once considered a top lottery pick, Labissiere struggled at Kentucky this year. I don’t care how old you are, a 7-footer shouldn’t play more than 10 minutes and not grab a single rebound. Skal did so three times this past season, with two more 10+ minute games with only one rebound. Still, if he actually has NBA range, he’s going to find a place as a Channing Frye type. Not remembering him from the Spartans this season? This is an upside pick. Aside from blocking shots and protecting the rim, Davis didn’t do much for Tom Izzo this season. He has the body and tools though, if someone can help him along. He’s a little bit too Michael Carter-Williamsy. He’s a better athlete but decision making and shooting aren’t his strong suits. Scores from all over and can defend a variety of ways. Will definitely fit somewhere. One of the biggest dice rolls in this draft. 19 years old, legit 7-footer, and skilled to an extent. A project that may pay off. UPDATE: OR WILL IT??? HOW OLD IS THON MAKER??? Several teams have entirely ruled Thon Maker out of the first round due to his age. Multiple sources believe Maker to be 21-23, not 19. WHO’S MANS IS THIS?? AND WHAT YEAR WAS HE BORN?? He can defend, rebound, and shoot. Perfect 7th or 8th man. Wrote about him earlier this week. There’s a role for him, if he isn’t a defensive trainwreck. Classic European stretch four, with some athletic pop. Greta 2nd round sleeper. Will score in the NBA, but can he defend? Can he be Dion Waiters at the next level? That would be good value late. There’s always room for a skilled big man. See Kaman, Chris for more information. There’s always room for a high IQ poiunt guard. See Joseph, Corey for more information. Shane McNichol is the founder, editor, and writer at PalestraBack.com. He has also contributed to SALTMoney.org, Rush The Court, ESPN.com, and USA Today Sports Weekly. Follow him on Twitter @OnTheShaneTrain. If you have any suggestions, tips, ideas, or questions, email them to palestraback@gmail.com.